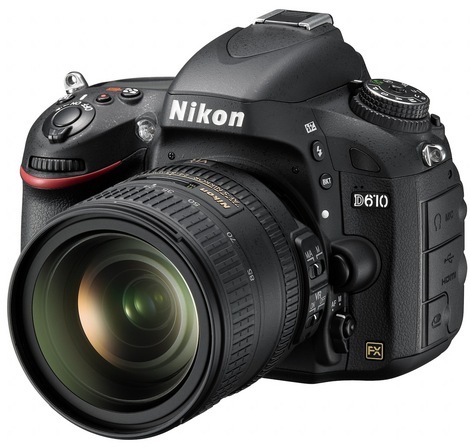 The Nikon D610 is their most affordable and compact full-frame (FX-format) camera. Both image quality and overall performance are excellent, and the video capabilities outperform most dSLRs on the market. Read more in our Full Conclusion. When we reviewed Nikon's D600 DSLR, we said it was a "powerful and very high quality pro-level DSLR with a smaller body and price tag that may appeal to wider range of photographers. It brings professional quality at a more affordable price." Today Nikon announced the D600's successor, the D610. It costs about $100 less than the D600, boasts many of the same specifications as well as a few improvements. Built with the same dust and moisture resistance of the Nikon D800, the D610 is constructed with magnesium alloy and its shutter unit it tested to 150,000 cycles. This camera is a full frame, or FX-format, DSLR with a 24.3-megapixel (35.9 x 24mm) CMOS image sensor and the EXPEED 3 image processing engine. Meaning, the D610 captures images with a large dynamic range, precise and vivid colors, and is a very fast , yet energy efficient camera. Other great features include a 3.2-inch (921K dots) vari-angle LCD display, a 39-Point AF (Auto Focus) System, Scene Recognition System, and a number of Advanced Modes. For example, not only do you have built-in HDR (High Dynamic Range) and Time-Lapse modes, but you also have Picture Controls to manually adjust color, saturation, and other image parameters. This professional-grade DSLR is just as adept at capturing Full 1080p HD video in 30fps as well as 24fps. For aspiring and professional filmmakers, this camera's HDMI out can run 100% full screen, uncompressed video to external devices like a display and/or digital recorder. There are also stereo microphone and headphones auxiliary jacks. Finally, those Picture Controls mentioned above can be applied to both still images as well as HD movies. In terms of newer features NOT available on the last generation D600, the D610 improved its Automatic White Balance (AWB) which helps artificial light and skin tones. The D610 is also faster than its older sibling -- it can shoot at up to 6 frames-per-second at full resolution. And, for quiet moments where you want to avoid hearing the noisy shutter every time you take a shot, there is the Quiet Continuous Shutter Mode, which shoots up to 3 frames-per-second in full resolution without making a sound. $2599.95: Body + AF-S NIKKOR 24-85MM F/3.5-4.5G ED VR Lens. $3049.95: Body + AF-S NIKKOR 28-300MM F/3.5-5.6G ED VR Lens + 32GB Class 10 memory card + Large Laptop Bag. $3249.95: Body +AF-S NIKKOR 24-85MM F/3.5-4.5G ED VR Lens + AF-S VR ZOOM-NIKKOR 70-300MM F/4.5-5.6G IF-ED Lens + WU-1b Wireless Mobile Adapter + D-SLR Tablet Bag + 32GB Class 10 memory card.